Whoever said desserts have to be extensively prepared to have the WOW! effect on guests? 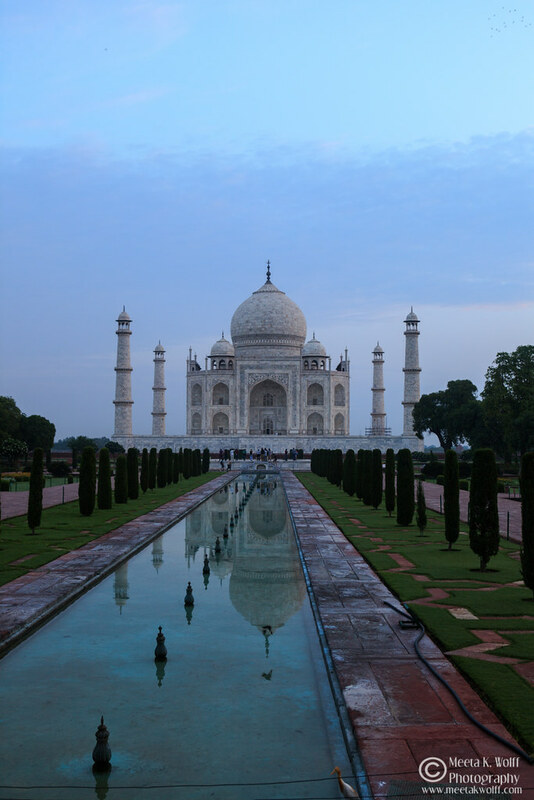 Do they need to be intricately decorated, with hours or maybe even days of preparation? I want a dessert to be whipped up, literally, in minutes. 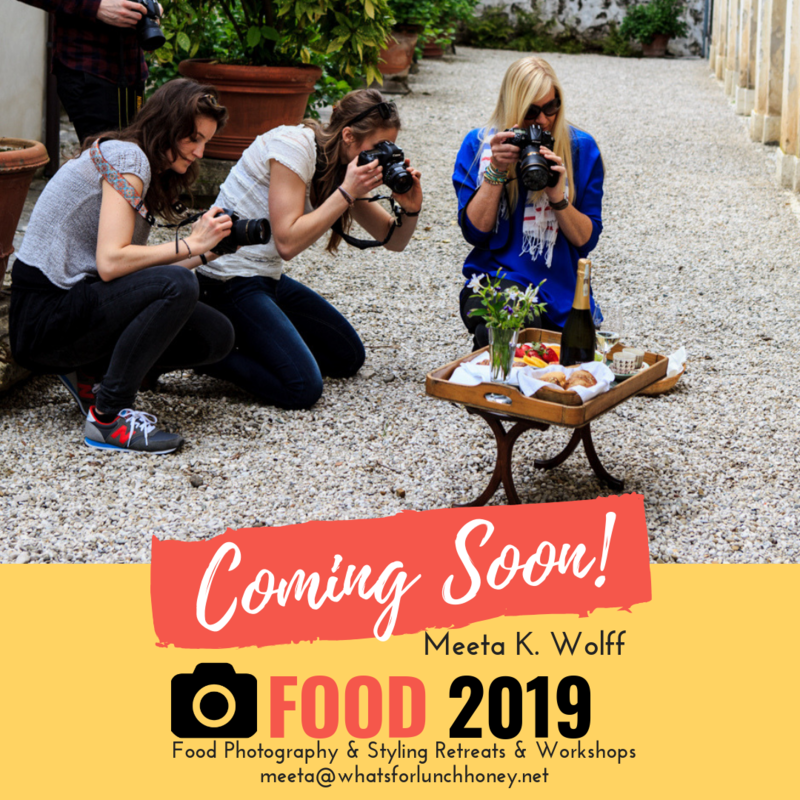 I want it to be full of taste and flavor and I want it to use fresh ingredients. I do not want to slog in the kitchen for hours after having doing just that for the main course. And I still want that WOW! effect on my guests faces. Can all this be true? Is it possible? Or am I selling you dreams. I say YES! It is true, it is possible and this is a dream. A dream come true!! This dessert is so perfect in every way that I had to call it a dream cream. 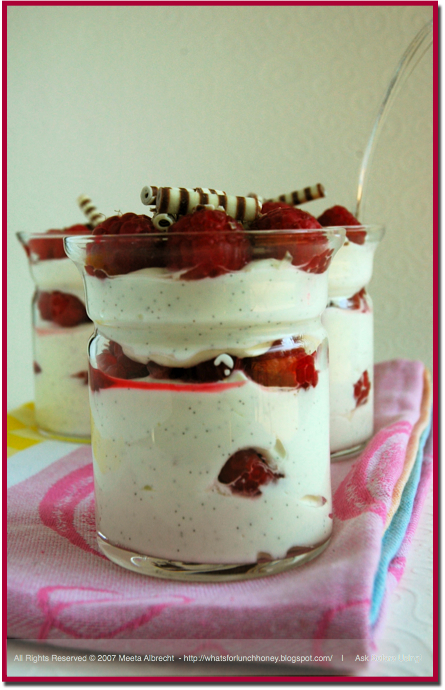 It uses the full bodied flavor of fresh raspberries and creamy mascarpone. Paired with the aroma of a vanilla bean and the fluffiness of quark, it becomes just unbeatable. 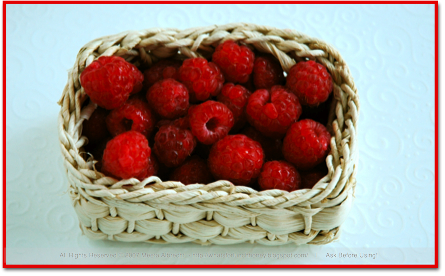 I love the purity of white against the striking red color of the raspberries. It's such a visual treat. 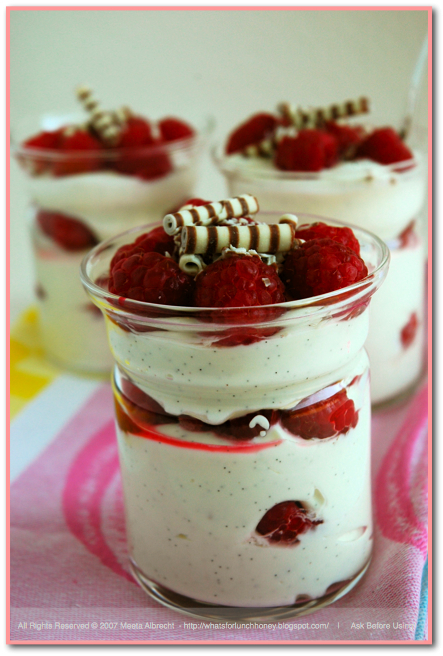 What I truly love in this dessert is the use of fresh organic raspberries. With summer just around the corner my organic store and Farmer's Market is bursting to the seams with a multitude of fresh berries. I cannot even begin to tell you how much we love berries in our household. We literally go through kilos of the stuff. 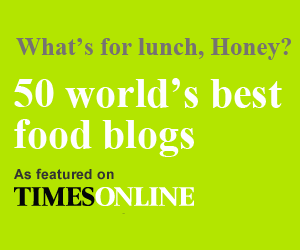 You'll find us adding them to our yogurt, muesli, desserts or just munching on them out of the fridge. Therefore, in the next few weeks you might just be seeing a lot of great dishes with raspberries, strawberries and co.
Or the "Queen of Berries" as they are called. Himbeere in German, Framboise in French and Lampone in Italian, raspberries are plump, juicy and fragrantly sweet with a slight hint of tartness. They are a perennial summer favorite and have a gorgeous melt-in-your-mouth texture. Raspberries were mentioned by Pliny and had the reputation of being a medicinal plant. It was cultivated and further developed in the Middle Ages, by monks and in the 17th century the red and yellow types of raspberries were already well known. The raspberry embodies indulgence and health almost ideally. The sweet flavor is only one reason to indulge in the delicate fruit. Rich in vitamin C, folate, iron and potassium, raspberries also provide high amounts of insoluble fiber as well as respectable amounts of the soluble fiber pectin, which helps control cholesterol levels. The fruit is a good source of ellagic acid and other cancer-fighting antioxidants. Since cooking does not destroy these compounds, raspberry jam may also be beneficial. But because the fruit tends to spoil quickly, freeze leftovers to use in cooking. Even the leaves of the raspberry bush are used for medicinal purposes. They have been used by herbalists to treat diarrhea and in midwifery, red raspberry has been connected to female health, including pregnancy. It was considered a remedy for excessive menstrual flow (menorrhagia) and as a “partus prepartor,” or an agent used during pregnancy to help prevent complications. There are more than 200 different known species of raspberries and raspberries contain 10-times more antioxidants than tomatoes or broccoli. Red raspberries are the most common type but there are also golden, amber, and purple berries all similar in taste and texture. Raspberry season begins in June and lasts through October. Raspberries are extremely perishable and they should therefore, only be purchased one or two days prior to use. Look for berries that are plump, firm and deep in color Avoid those that are soft, mushy or moldy. 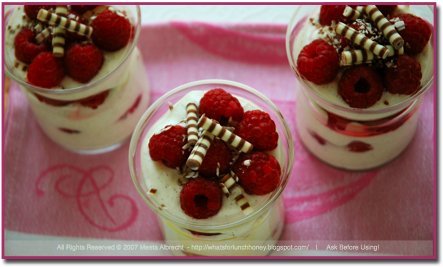 Make sure that the raspberries are not packed too tightly in pre-packed containers, as this may crush and damage them. Also make sure the container has no signs of stains or moisture which is an indication of possible spoilage. As raspberries are one of the most perishable fruits, extreme care should be taken when storing them. Before you store them in the refrigerator, remove any berries that are molded or spoiled so that they will not contaminate the others. Place the unwashed berries back in their original container or spread them out on a plate lined with a paper towel, then cover the plate with plastic wrap. Raspberries will keep fresh in the refrigerator for one or two days. Make sure not to leave raspberries at room temperature or exposed to sunlight for too long, as this will cause them to spoil. Raspberries freeze very well, so I buy them in large amounts to use throughout the months they are not available. Wash them gently so that they maintain their delicate shape, then pat dry with a paper towel. Allow them to completely dry before placing them in the freezer. Arrange them in a single layer on cookie sheet and place them in the freezer. Once the berries are frozen, transfer them to plastic bags or freezer containers. Frozen berries should last approximately ten months to one year. Adding a bit of lemon juice to the raspberries will help to preserve their color. Substitute quark with thick yogurt. Mascarpone cheese should be stored in the refrigerator in an air-tight container as it takes on the aromas from other items in the fridge. If you do not have a vanilla bean on hand, simply use some vanilla sugar instead. If you are using frozen raspberries do not thaw them prior to making the dessert. Use them frozen. However, once thawed the dessert could become more liquidy. In a large mixing bowl whip the quark, mascarpone, milk and sugar until smooth and creamy. Add in the vanilla and lemon juice and mix to incorporate. 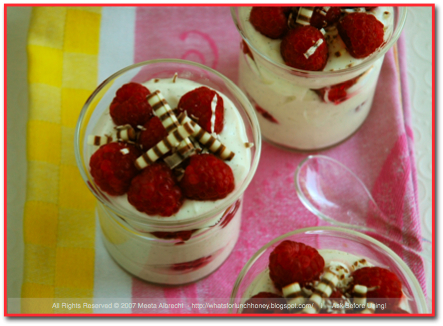 In clean glasses or bowls layer the fresh raspberries and cream on top of each other. Finish with a layer of raspberries. Place in the refrigerator and allow to set for at least 1 hour. Just before serving sprinkle the grated chocolate or decorate with the chocolate rolls. Easy going dessert - pure and simple. Here the one doing most of the work is the refrigerator! Soeren just loved this dessert. Ever since I made this every time I ask "What should we make for dessert!" his answer is always the same "that raspberry cream!" Tom and my guests could not stop scraping the remaining cream from the sides of the glasses. The spoons were licked clean and the looks on their faces told me they all wanted seconds. It really did have that WOW! effect. This is my entry to this month's Sugar High Friday. It is being hosted by Tara of Seven Spoons with the fantastic theme Neutral Territory where we were to make a dessert in a hue of white. For more pristine white sweetness check out the roundup. 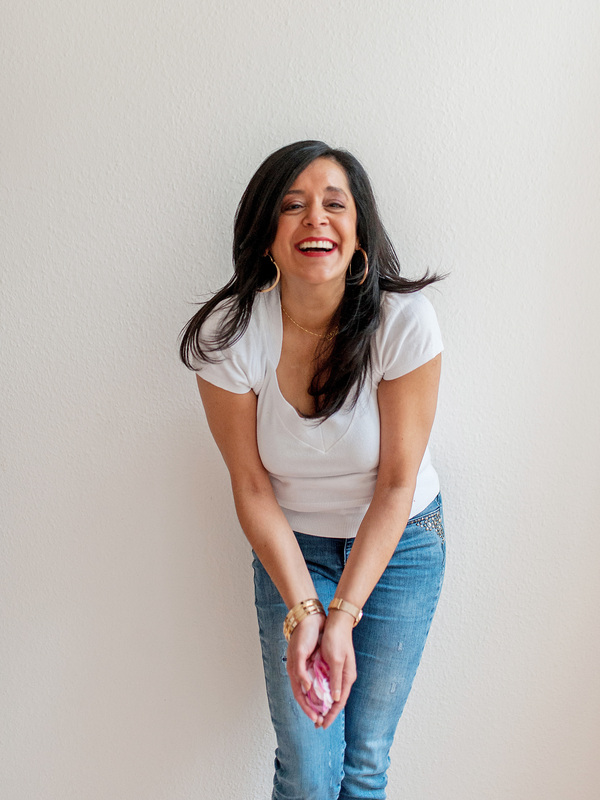 The lovely Padmaja is hosting this month's Weekend Breakfast Blogging where she chose the wonderful theme Summer Fruits. So, I hope she will accept my sweet offerings with fruity raspberries. Wow, Meeta, how do you make such beautiful food and informative posts at the same time? I appreciate the time you put into preparing them. :) I don't know if I can find Quark in Italy...I'll look! Yum! Simply beautiful. I bet they taste delicious too. Fantastic Meeta, i loved this dish to the core....cant wait to make it...my bday is on next monday...so can kinda make it a bday treat !!!! I will do so within the next few days and try your recipes. It looks delicious and sounds promising. The problem with a dessert like that is that the guests go "wow" staring at all the empty dishes I ate instead of them....Mascarpone, quark, lemon and raspberries...Yummmmm! 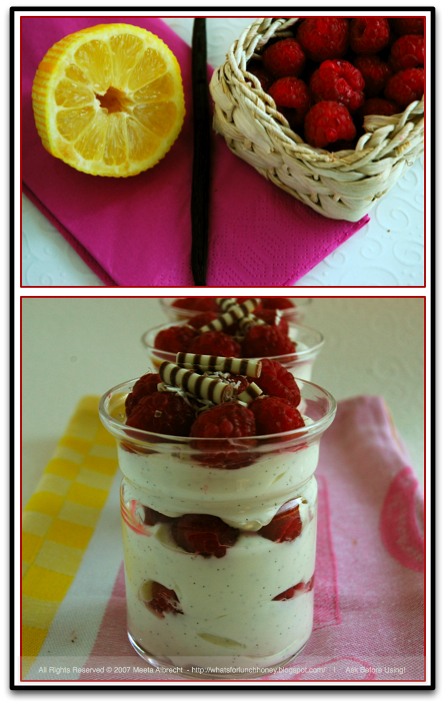 mascarpone and raspberries for breakfast? you're my kinda gal, meeta. :-) what a beautiful dish. can't wait for the raspberries in our garden to ripen. You could have lied and told us it took you forever to create this masterpiece and we would have believed you! u can mail me n tell me how long it exactly took u to create this stunning piece of art meeta;) absolutely stunning!!! These are gorgeous!! I will have to check at the market to see if I can find quark. wowwwwwwwwwww!! !what a desert!! !and such beautiful pic's :-) looks very nice. A definite wow factor indeed. Delicious as always, Meeta! I love the little white and dark chocolate curls on the top too! This pudding seems virtuous in it's simplicity! And then you must tell me what I can use instead of raspberries :-)! Beautiful presentation! I commented on this yesterday - blogger must have eaten my post, grrr. Yes, dessert for breakfast. Give me raspberries any day! We once had a neighbor who would let me pick his raspberry bushes after he picked for the day. I always went home with between a quart or two and felt like I was carrying red gold! What a lovely dessert! Great info too Meeta. Those are gorgeous with those little flecks of vanilla bean, I bet they taste heavenly. Oh folks, thanks for all your wonderful comments. I am glad you liked this dessert! And honestly it only took a whip of the cream to make this dream!! LOL! Gulp! That cream does look like a dream! I haven't seen any raspberries worth buying at the moment (the season is in July), but I'm bookmarking the recipe for sure. Great shots! That looks incredible! My kind of dessert -- fresh cream and vanilla bean. Perfect combination in my mind! simply amazing...great colours...gotta try it for sure...thanks for sharing..
fresh fruits really stand on their own adn should only be accented by other ingredients. this looks wonderful! I think there's just enough room for me to wiggle into the layers between the raspberry and cream. You're my hero, Meeta! I like easy desserts that feature fruit. 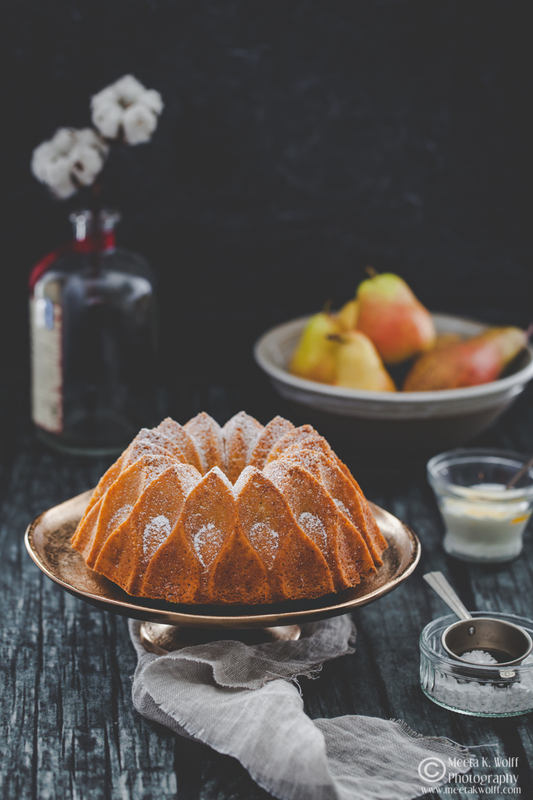 What's so perfect about this dessert is that it looks so elegant yet is easy to make. Oh, thank you! Absolutely stunning; your attention to detail in plating is superb, even though you declare the dish simple. So beautiful for the season, I really appreciate your contribution! These photos go into some of my favorites of yours. What a great post and a gorgeous looking dessert. I must try this recipe. It looks stunning. I don't now if I can find quark in UK but if not then what I can subsitute this with? Made this for our anniversary lunch this afternoon substituting the raspberries with mangoes. It's simple and simply fabulous! Thank you Meeta! This is a slam dunk! I made it over the weekend with beautiful, luscious, perfumey raspberries. This was the recipe that helped me find your website last year, so it has a special place in my heart. I think your site is really gorgeous, your posts so thoughtful and moving and your skill in the kitchen ineffably creative. Thanks for such gorgeous pictures, too. You made me want to return to Venice, and helped me revisit my memories in a deeper way. Thank you!